Physical characteristics: Nuthatches have blue-gray upperparts, rusty under parts, brown to white undersides, a blue-gray crown, a white throat, and a black line through the eyes with a white line above them. 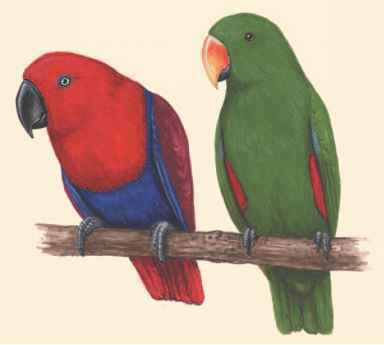 Coloration varies greatly due to the species' very large range. Females and juveniles have a duller head coloring and paler under parts. They are 5.5 inches (14 centimeters) long, with a short tail, and weigh 0.7 to 0.9 ounces (20 to 25 grams). Geographic range: The birds range widely in temperate Eurasia, from the western coast of the Atlantic Ocean to the eastern coast of the Pacific Ocean. They have the most extensive range of all nuthatches. 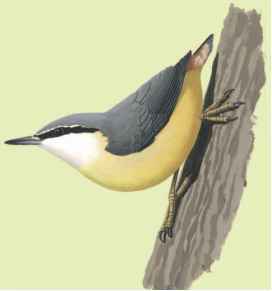 Habitat: Nuthatches are located in mature temperate forests, from deciduous to coniferous ones. seeds during winter months. Nuts are wedged into crevices and then broken open with hits from the bird's bill. Behavior and reproduction: Nuthatches are often seen running along tree branches or up and down trunks in search of insects. They occur as pairs that defend a breeding territory. The birds do not migrate. During the nonbreeding season, nuthatches are seen in flocks with many different species. Pairs nest in cavities and holes of trees. Nests are cup-shaped and made of bark flakes. The entrance to the nest is often plastered with mud to reduce its size to the width of the female's body, in order to deter enemies. Females sit on the eggs, but both sexes feed the chicks. Nuthatches and people: People and nuthatches have no known significant relationship. Harrison, Colin James Oliver. Birds of the World. London, U.K. and New York: Dorling Kindersley, 1993.